An email came across my inbox while I was away on spring break tempting me with a recipe for a lemon icebox cake. I could not get the craving out of my head so when I got home, I made it! 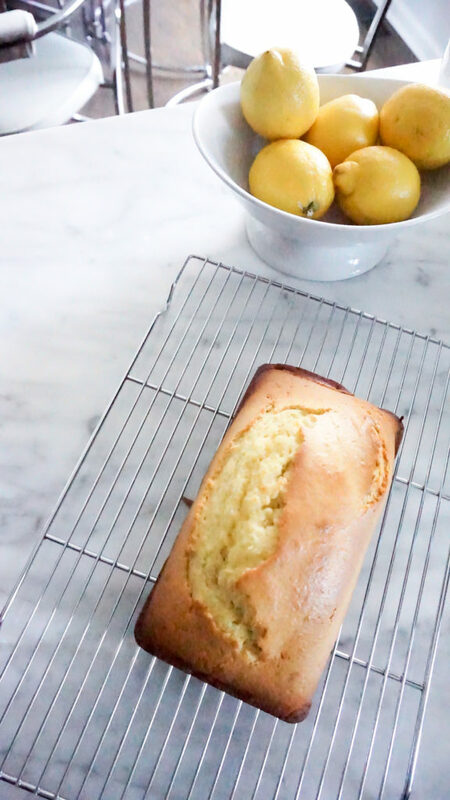 Adding lemon to baked goods seems like a natural progression into spring baking! And with Easter coming up, I wanted to share another lemon dessert that is perfect to have on hand for the holiday weekend. In truth, we have no Easter plans yet other than attending church. At this point, it is probably too late to make a brunch reservation somewhere. So I know come Friday, I will be putting together a last minute Easter menu for our family! 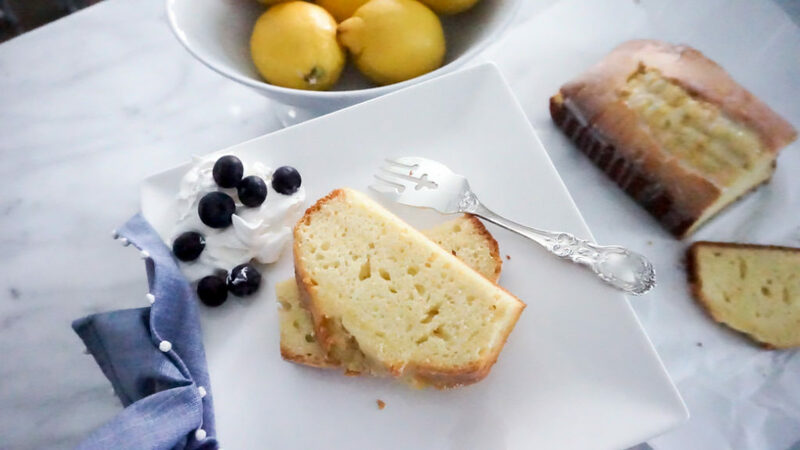 Yes, I could make the lemon ice box cake again for our dessert (it was delicious and the recipe is here) but lemon loaf bread is just as good and a lot simpler to make! 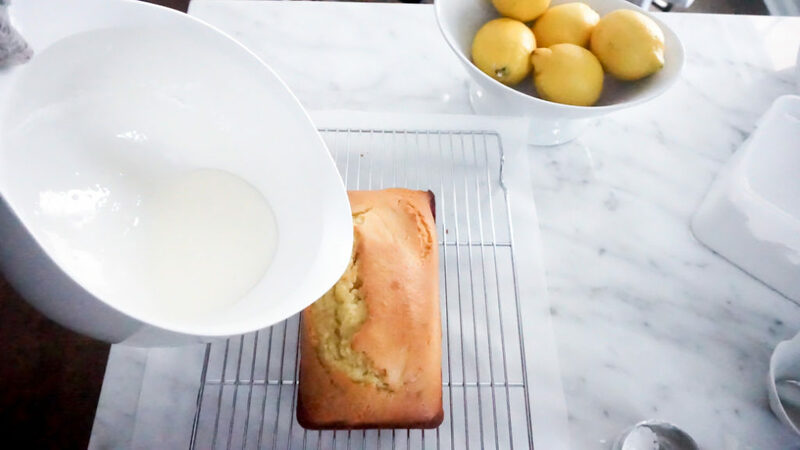 What I love about a lemon loaf is that it works for all day serving. Serve it as part of breakfast, brunch or midday tea. It presents beautifully as a refreshing dessert after dinner alongside fresh fruit and a dollop of whipped cream. 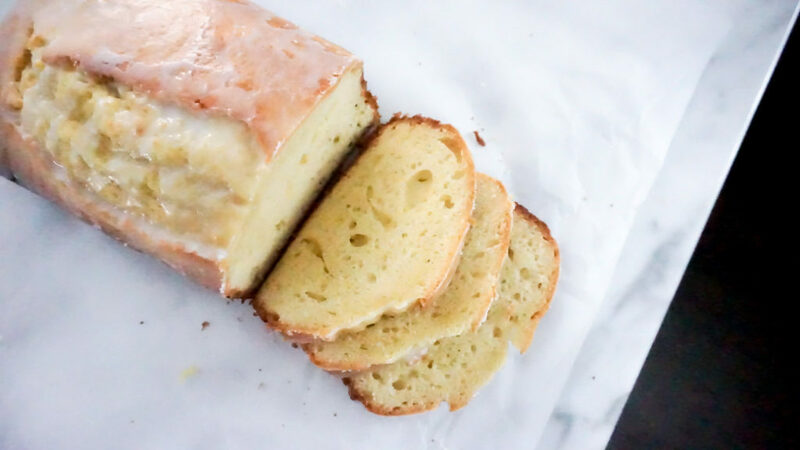 Lemon loaf bread is easy to wrap up and bring to someone’s home or deliver as a thank you to a friend. Like anything, there are dozens of different recipes to choose from in making lemon bread. I am sharing this particular one because if you have indulged in the Starbucks lemon loaf cake, then this is a dead ringer for it! Personally, I like my lemon bread to be a nice blend of sweet and tart. Dense but moist. Lemony but rich and not at all oily. If that is your preference too, then give this recipe a try! Mine got too brown on the sides ( I need a new pan!). You can always slice off and then glaze. Also see recipe notes on tenting during baking. To prepare loaf: In a large bowl, add the eggs, sugar, greek yogurt, and whisk vigorously until smooth and combined. Add the flour, baking powder, salt, and stir until just combined, don’t over mix. Some lumps will be present; don’t try to stir them smooth. 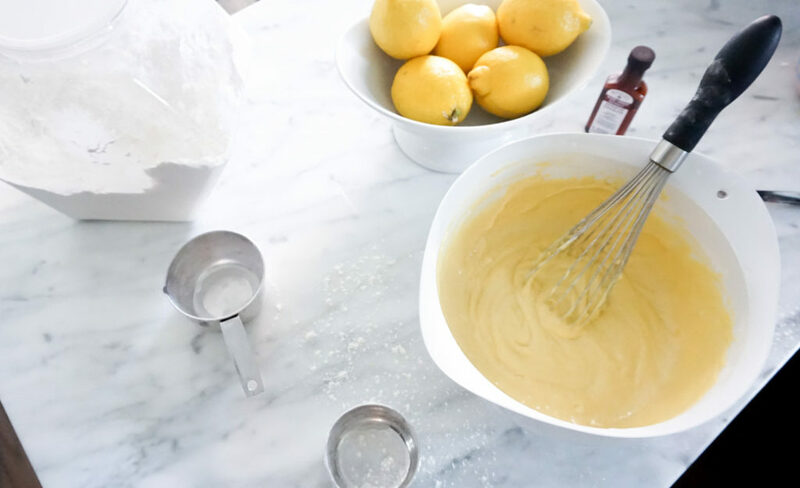 To prepare lemon glaze: In a small bowl, add the confectioner’s sugar and slowly drizzle in the lemon juice while whisking until smooth and combined. You may need to play with the sugar and lemon juice amounts a bit as necessary for desired consistency and flavor. I like the consistency to be where the glaze just slightly hangs on to the spoon when turned upside down. Evenly drizzle glaze over bread before slicing and serving. Tip: I lay out a piece of parchment paper underneath the cooling rack, place the the bread on top of the rack and drizzle with the glaze. Once done glazing, simply throw away the parchment paper with the glaze aftermath. Bread will keep airtight at room temperature for up to 5 days or in the freezer for up to 6 months. Avoid storing in the fridge as it will dry out.